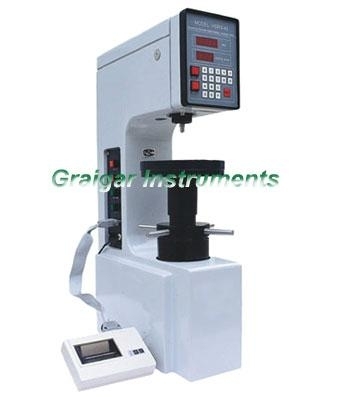 HSRS-45 Digital Dispaly Superficial Rockwell Hardness Tester is suitable to determine the Superficial Rockwell hardness of ferrous metals, alloy steels and hard alloys, as well as treated layers of metal surface, such as carburized layer, nitrided layer and electroplated coating, etc. It's suitable to determine the Superficial Rockwell hardness of ferrous metals, alloy steels and hard alloys, as well as treated layers of metal surface, such as carburized layer, nitrided layer and electroplated coating, etc. Large flat anvil: 1 pc. Small flat anvil: 1 pc. Diamond cone penetrator: 1 pc. 1/16" steel ball penetrator: 1 pc. Superficial Rockwell standardized block: 4 pcs.